I’m always telling participants in our 30-Day Accelerator they’ll never think their way to growth. The most effective method of learning is by doing. Taking action on your business will help you grow faster than just thinking about it. Ann Mei Chang shares how to create social impact by experimenting with different ideas to see what sticks. She has a lot of valuable insights into how to accelerate your progress! Her newly released book, Lean Impact, describes different ways to think about entrepreneurship for social impact, as well as ethical ways to innovate in businesses that work toward a social good. 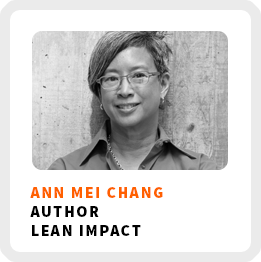 She currently serves as the Executive Director of Lean Impact for the Lean Startup Company. Identify with where you are and what you’re doing rather than what people might expect to hear. Differences between optimizing for a typical business and optimizing for social impact. Ways to ethically apply innovation to social impact projects. Things to think about when building a socially conscious business. How she dealt with her own shift in work when she left working for the government to working from home as an author. Wake up time: It varies, especially when traveling. Core work activities + habits: 1) Researching for the book. 2) Having the humility to find smarter, more experienced people to learn from. 3) Getting the word out about the book. Ideal work environment: At her desk at home. 90-day goal: Get the word out about the book as broadly as possible and get people to think a little differently about work.